Shares of CVR Partners LP and Rentech Nitrogen Partners both increased on the heels of a merger last month. Here's what you need to know. 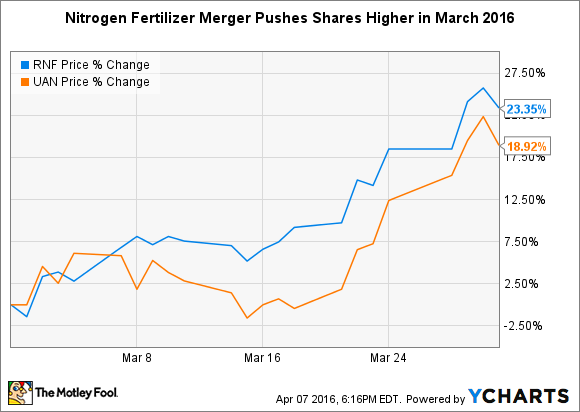 What: Shares of nitrogen fertilizer manufacturer CVR Partners LP (NYSE:UAN) rose 18.9% in March as the merger with Rentech Nitrogen Partners, which rose 23.3% last month, neared completion. The merger was finalized on April 1, and shares of Rentech Nitrogen Partners stopped trading on the New York Stock Exchange, as the combined company will operate under the CVR Partners LP flag. So what: This could be a win-win for both companies, which, in recent years, have suffered from low nitrogen-fertilizer prices and a lack of diversity in manufacturing operations. At the time of the merger, each company owned just a single manufacturing plant: CVR Partners maintained the Coffeyville, Kansas facility, while Rentech Nitrogen Partners sported the East Dubuque, Illinois facility. Source: CVR Partners press release. The merger gives CVR Partners LP more insulation against market volatility, provides an enhanced geographical footprint, allows for feedstock diversification, and protects against unscheduled downtime in manufacturing operations -- something that has plagued investors of both companies in the past. Now what: Investors of CVR Partners LP and Rentech Nitrogen Partners are likely very much interested in the large annual payouts from the MLP structure. Mitigating risks and growing operations could help to boost payouts in the future, but volatility in commodity markets remains out of the company's control. While the company's operations are heading in the right direction, and I like the merger, I'm still sticking to the sidelines until I see how smoothly the integration unfolds.